Description: Dual-port 10GbE SFP+ network expansion card, Brackets for rackmount,tower and full height models are included. 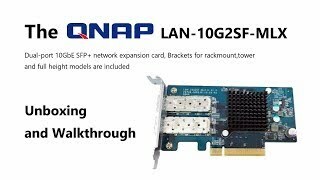 IMPORTANT NOTICE: The 10GbE network expansion card can be used with QNAP NAS only. Do not try to install the card in other system such as computer or server. Good video comparing RJ45 against SFP+ but what you don't mention/warn that you could require one certified SFP+ for your NAS and a different certified SFP+ for your switch. Why is this the case? If this is the case if I buy a direct attach cable for my QNAP TVS NAS will it work with my Ubiquiti EdgeSwitch?